Term life insurance is a great way to set your mind at ease that your loved ones will be taken care of and have guaranteed protection if you pass away. State Farm’s recent polling indicates that only 4 in 10 Americans buy life insurance after big life events, like creating a family and buying a home, to cover their dependents’ payments in the event of their unexpected passing. Term life is, by design, more affordable that whole life policies because of the differing nature of the two products. However, many don’t understand the distinction. For those with dependents, life insurance is a necessary part of the conscientious financial life. We’ll better explain the facets of term life insurance below. 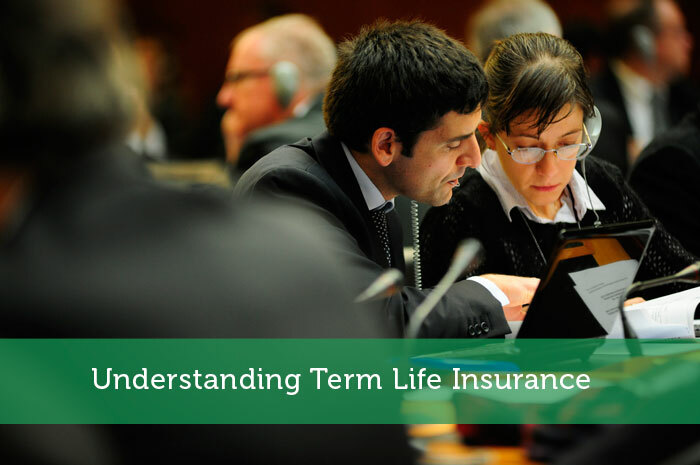 So what is the difference between term and whole/permanent life insurance? With term life insurance, you will select a certain number of years to hold your policy, to be in place over the course of your life expectancy or any other period of time that you choose. Whole life insurance is part insurance, part investment. To fund the investment portion of whole life insurance, the insured will pay sometimes thousands of dollars a year. The monthly payment for term insurance usually totals only hundreds annually. Think of whole life insurance as a business investment, and because it is an investment, you will be required to put forward much more money than with term. It is sound investment advice to have both investments and insurance, but it is often profitable for the two to be separate and distinct. Wisely chosen investment sources can have higher levels of returns than a more conservative investment package offered by an insurer. However, permanent life insurance may offer real benefit to your individual portfolio. To learn more, contact your insurer or trusted tax professional. Term life insurance can be adjusted to meet your specific needs. If you want to ensure that your spouse isn’t saddled with your home mortgage in the event of your sudden death, a term insurance policy can be drafted to expire after the loan is scheduled to be fully paid off. A similar plan could expire after your children are old enough to have completed their education. Many term life insurance policies will allow you to add additional coverage to a current policy if you choose. Whatever you choose, you should always buy enough life insurance to cover the specific needs abundantly. The last thing you want is for your dependents to have insufficient resources after your death when only a few more dollars monthly would have significantly increased their coverage. Also, take care in selecting the length of your policy. Strategic term life insurance can give you and your loved ones real peace of mind. It is important to note that the information you provide to your insurance company should always be accurate. While information about your health and sky diving obsession may increase your payments, falsifying such information could nullify aspects of your policy. We are now considering to upgrade ours to permanent? Can a term insurance be upgraded to permanent life insurance? What are things to consider? Will we lose some money from the payments we did for the term insurance? Cheap term life insurance FTW. No reason at all to even look at whole life insurance. We’re looking at reducing our coverage these days as we continue to build our net worth an in essence start self-insuring. It’s shocking how many people need term coverage and don’t get it. Whether they think it is too expensive or that it isn’t necessary or perhaps they just haven’t thought of it at all, a lack of term life insurance can be devasting to a family. I think it’s really important not just to evaluate your own term life needs, but those of close loved ones as well. I have a mixture of whole and term life insurance to ensure my family is taken care of in the case of a tragedy. As I get older and more financially secure, I can drop some of the term insurance, and stick with my whole life policies. What I like about term life insurance is, you can assess your situation again after the term is finished and decide whether you need it anymore or not. Say, you got a 10 year term policy and by the time it ends up, you don’t have any more dependents. So, you can decide not to renew it. Another important fact is Affordability which is probably the first thing that comes to the mind of people. My parents just started their life insurance. I wonder what the recommended age is that you should get it. I am glad I still have a few years before I have to seriously consider it though. My wife and I recently welcomed our first child into our family, and we have been thinking about getting life insurance in case anything happens to us. The only problem is that we don’t know much about it. Term life insurance sounds like an excellent option, because then we can establish how long we want it to be in effect, and we can adjust the costs. I think this would be the best option for us right now, at least until we are able to afford to invest in our life insurance. many don’t understand the distinction. For those with dependents, life insurance is a necessary part of the conscientious financial life. We’ll better explain the facets of term life insurance below. It’s good that you explained the different types of life insurance. It makes sense that they have a few different options, because everyone’s situation is a little bit different. I can imagine that everyone can find a life insurance to fit what there family needs for now and the future. It’s always good to look ahead. Thanks for the explanation of what term life insurance really entails. I have been wanting to get some kind of life insurance put in place, but I haven’t known how to go about doing so, nor what kind of plan would be best. I’d love to get term life insurance that was more catered to the timeline within my family. Thanks for the information. To be honest, insurance is such a confusing topic to me. I want to make sure I choose the right type of life insurance for myself. I’ll make sure I follow your tip about making sure my dependents have sufficient resources after my death. Hopefully that’ll ensure that everything is taken care of if I die. Do you have any other tips? Thank you for this information. I want to purchase life insurance, but I’m not sure I can afford it. What you said about term life insurance being part insurance part investment really stood out to me. I’ll have to look into that option some more. It is really helpful to be able to learn more about life insurance. I have been thinking about getting life insurance for a while, but I don’t really understand it as well as I should. It is really nice that term life insurance can be adjusted to be sure that all of my needs are met. I would really like to be able to get some good insurance that can cover everything I need so that if anything happens to me my family will be supported. Thanks for the great post! My daughter is getting married next month, and I think it’s time to invest in term life insurance. I wouldn’t want anything to happen to her or me, so I’m visiting with my insurance agent later this week. How much can costs between different life insurance plans vary? I like what you mentioned about, “whatever you choose, you should always buy enough life insurance to cover the specific needs abundantly”. If you are going to get life insurance I believe it should be abundant. I would want to make sure that I take care of as much as I need too. I feel like it is very important for people to understand the terms of life insurance before they purchase it. I’m glad there are different options for people, since everyone’s situation is a little different.Even though people question whether or not to buy it. I feel like it better to be safe then sorry. Thanks for posting this! I’ve been feeling a bit confused about the differences between term and whole life insurance. I recently got married, so I need to find a good insurance plan. It seems like term life insurance would be more affordable since I wouldn’t have to pay the investment portion of it each month. If I only have to pay hundreds annually for term insurance compared to whole life insurance, then I should probably go with term insurance since that’s what I can afford right now. It is so true that life insurance companies and top agencies buy their way to the front page of google organic searches by paying for backlinks to their sites. I think I will seriously consider term life insurance after reading this post. It makes sense to compartmentalize investment and insurance. I’ll have to talk this over with my wife to see what she thinks. Thanks! Termporary life insurance is also a good choice in a certain circumstances. I think, when our children grew older and thus they can support their life on their own, a permanent life insurance is becoming less valuable in a way and that is one of the reasons that some elderly came to conclusion to sell their policy to a third party now right? I would prefer a term life insurance rather than a whole life. Although it would be much more expensive if you want to extend the insurance when it expires, but It is a great option in securing my children especially because they are very vulnerable this time but 30 years later, I don’t think they need financial help anymore because they will have their own job and I would worry about myself more rather than them haha. Thanks for the tip about how life insurance can be so important. Luckily, from my experience, it’s also fairly affordable. A friend of mine works in a company that offers life insurance. I’ll have to see if he ended up getting it. Thanks again! I think term life insurance is the right fit for 90+% of people, however, there are some situations where permanent policies make sense. If you have already maxed out your tax-advantaged savings accounts (401K, IRA, etc) and don’t like to take on risk, the safety of the investment component in many whole life policies can be a nice fit. We like to make sure our clients are aware of the conversion options in the term policies they are considering. This is one area where permanents policies ALWAYS make sense. If you develop a health condition down the road, you can convert to a permanent policy without evidence of insurability. Many of these people would be declined if they went shopping for new term coverage at that point. I agree that you should always buy enough insurance to cover your needs. Your really need to go out of your way to protect your family if you pass. Do you have any other tips about buying life insurance? I may be leaning towards whole life insurance, but I can’t quite make up my mind yet.